How fast can you type on your smartphone or mobile device? Besides depending on personal skill, the text input predictive capability plays an important role in enabling fast typing in a constraint keyboard size on mini devices. As part of the effort to improve the great typing experience on mobile device, Swype has unveiled a new virtual keyboard typing technology that is claimed to speed up the text input speed to 50 words per minute with the assistance of an intelligent predictive software algorithm. 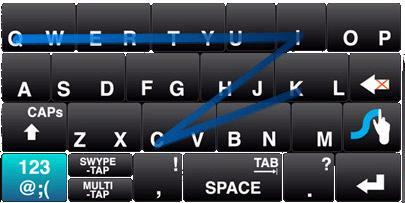 Users do not even need to touch on the keystroke for typing. Instead, they just need to slide their finger from one letter to another, passing through those keystrokes that are required to complete the word. In this simple process, a list of potential words will be displayed and user just needs to select the right one to be put in the text messaging. According to its co-founder, Cliff Kushler who was also the inventor of famous T9 input predictive method for mobile devices, although it looks simple to be used but the whole software development is said to take more than four years to complete and ready for market. The new input software is already available in demo version for both Windows desktop and Windows Mobile OS. According to the company, there is a plan to roll it out for other market segments such as kiosks, gaming machine, virtual screens and etc.